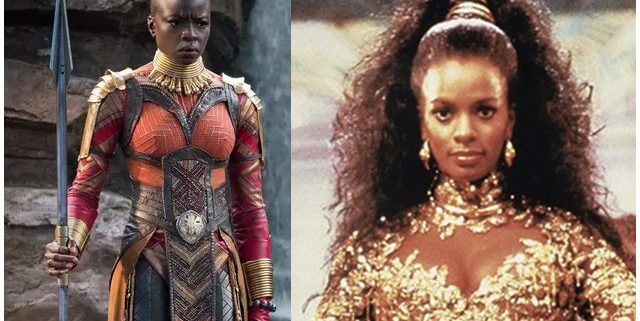 Three decades before filmgoers around the world fell in love with the royal family of Wakanda in this year’s blockbuster, “Black Panther,” they fell in love with the royal family of another fictional African country — Zamunda, from the 1988 comedy “Coming to America,” starring Eddie Murphy. UCLA’s own Deborah Nadoolman Landis, costume designer, historian and professor in the UCLA School of Theater, Film and Television played a pivotal role in the visual style and enduring appeal of that film. She designed all of the costumes for “Coming to America,” including hundreds of elaborate gowns, headdresses and jewelry — all with an eye toward African authenticity. 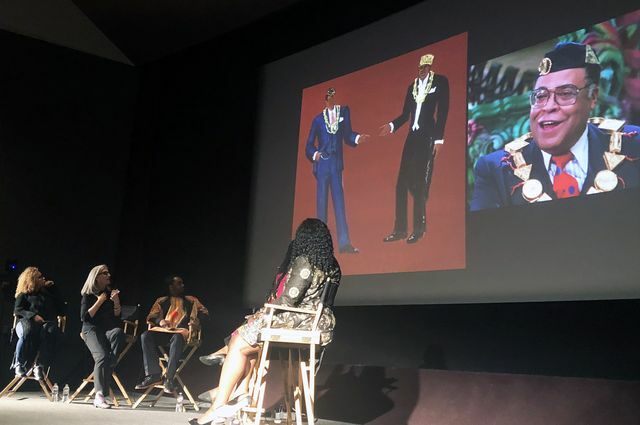 Marcus Hunter, chair of the African American studies department at UCLA, invited Landis to talk about her work on the film alongside Ruth Carter, costume designer for “Black Panther,” during an event held recently at the James Bridges Theater on campus. As chair of the department, Hunter said he wants to honor things that cultivated him as a young black person — and “Coming to America” is one of those things. Landis, who serves as founding director and chair of UCLA’s David C. Copley Center for the Study of Costume Design, shared original sketches and behind-the-scenes footage from her work on “Coming to America.” She talked about combing through fabric stores in New York City to find just the right piece for a particular character and how she relied on the famed Brixton Market in London to acquire huge amounts of authentic African fabric. As a designer, it’s important to make the perfect style choices for each character, she said, and especially for this film, so the actors would feel comfortable, beautiful and powerful. Designing “Coming to America” was a challenge, she recalled. “First of all, there was no internet, there was no internet, there was no internet,” Landis joked as the crowd laughed. From a young age, Landis knew she wanted to be a costume designer and was always thrilled by the black and white images from African Arts magazine. 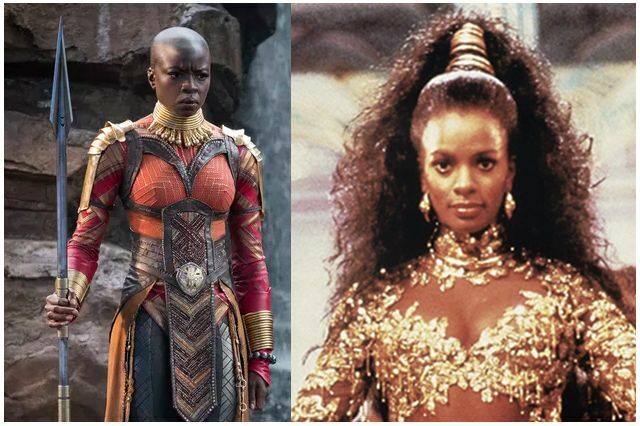 She relied on those images and others from her research to bring Zamunda to vibrant life on the screen through its inhabitants and their clothing. Costume design is a labor of love, she said. The designer does the same level of work for a movie regardless of whether that film eventually goes on to win awards, acclaim or box office success. While Landis, whose husband John Landis directed “Coming to America,” had a lot of autonomy to conceive and execute the fashion palette for that film, for “Black Panther,” Carter was greeted with a massive and intricately formed production bible that articulated the rich back story and visual style of the world she would help to build in its movie form. The vision for “Black Panther” costumes was informed by director Ryan Coogler’s extended experience visiting Africa and real countries and cultures that inspired both the movie and the comic book source material. 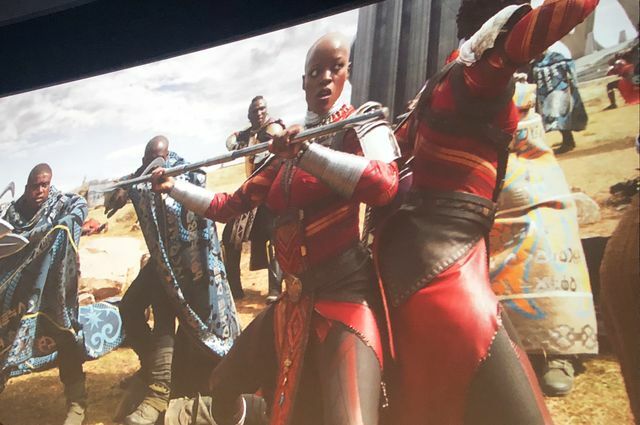 Carter talked about the intricacies of the costumes for the elite female warriors from “Black Panther” — the Dora Milaje. The hand-tooled tabards worn down the front of the body were individualized with charms and talismans specific to each woman. The long skirts worn by the Dora over their high-tech, full-body armor were inspired by those worn by the Himba women of Namibia. Still from the Marvel movie “Black Panther” depicting the female warriors of Wakanda, the Dora Milaje. “I wanted these to feel like they could have been handed down from generation to generation of the Dora,” Carter said. Coogler loved the blanket-like outerwear of the people of Lesotho in Southern Africa, and their garb was adopted for the members of Wakanda’s Border Tribe. As essentially Wakanda’s police force, Coogler wanted a blue color palette — the color associated with policing, Carter said. Anytime you see silver in the fabric of clothing worn by Wakandans, it represents the valuable and powerful mineral, Vibranium, which sustains the culture and advanced technology of Wakanda, Carter said. Her career began right around the time “Coming to America” hit theaters. Carter shared shots of the “Black Panther” cast wearing “Coming to America” costumes for Lupita Nyong’o’s (who played Nakia in “Black Panther”) birthday party. “Everybody wanted me to make them a ‘Coming to America’” outfit,” she said. Also participating in Tuesday’s discussion were UCLA lecturer Tananarive Due, who teaches courses on Afrofuturism in the African American studies department, and the owners of Kutula by Africana, the Los Angeles-based design house and retail shop for African fabric and couture.